While the global markets reacted bitterly in what is seen as a trade war initiated by US mainly targeting Chine, the Indian Markets too ended the week on a weaker note. The benchmark NIFTY ended the week with a net loss of 197.10 points or 1.93% on a weekly basis. The ending of this week has left us hanging in a precarious manner. On one hand, the lead oscillators points towards Markets dealing with oversold zones, there is also a potential minor breach of the 27-month long upward rising channel that the NIFTY has been trading in since the beginning of 2016. Coming week remains short week with Thursday and Friday being trading holidays. Nevertheless, it remains extremely tricky as well. We head into expiry of the current derivative series in this short week on Wednesday. Though NIFTY may struggle to pullback a bit, the levels of 200-DMA have established themselves as a major resistance area for the Markets to conquer. The zones of 9980-9920 will continue to offer important support. 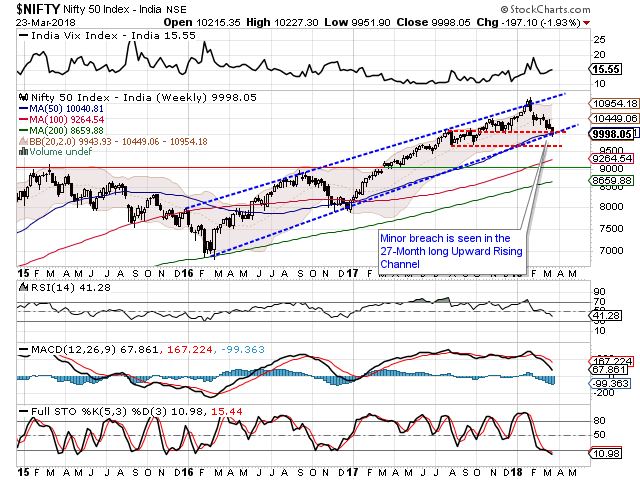 There are possibilities that the NIFTY attempts a minor pullback but the week surely promises to remain tricky. The Relative Strength Index – RSI on the Weekly Charts is 41.2805 has reached the lowest value in last 14-period which is bearish. However, it does not show any divergence against the price. The Weekly MACD stays bearish while trading below its signal line. No major formations were observed on Candles. The pattern analysis of the Weekly Charts shows two important things. 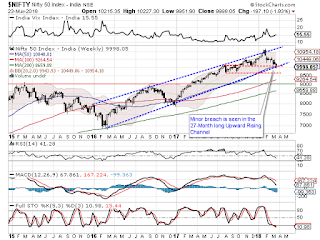 First, the NIFTY has slightly breached the 27-month long upward rising channel. Though the breach as of now is not a major one, but it certainly remains an important one. On the other hand, the NIFTY is seen taking support on the 50-Period Moving Average on the Weekly Charts. NIFTY had move above this 50-Period Moving Average in early 2017and had never tested it since then. All in all, the conclusion that we can draw from this is that the NIFTY though has shown a minor breach on the Weekly Charts, there are still chances of it finding stability subject to some stability in the global Markets. However, given the shorter week, we do not see any runway up move or a pullback in the Markets. Avoiding fresh positions, preserving cash and approaching markets with great caution is what is advised for the coming week. A study of Relative Rotation Graphs – RRG this week show that there are not much places left to hide. However, we expect resilient performance from pockets of IT, Financial Services, Services and FMCG pack. 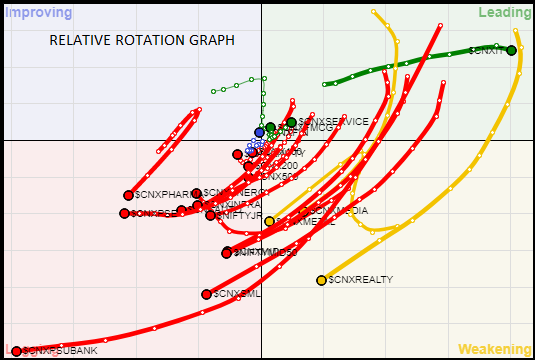 Also, isolated out-performances may come from NIFTY Junior, and ENERGY universe. Apart from this, no major relative out-performances are expected this week.